Once again, the Wizards have given us a duel deck, this time featuring the Theros block planeswalkers Elspeth and Kiora. Elspeth has seen a lot of play in the Standard environment, being the bomb of choice for both midrange and control decks. She can undo much of the work you accomplished in the early game if you are playing aggro. And she provides the necessary bite during the end game for control decks. Kiora is a good early game planeswalker who can really “bring it” if she gets to her ultimate ability, otherwise preventing damage and creating ramp and card draw. 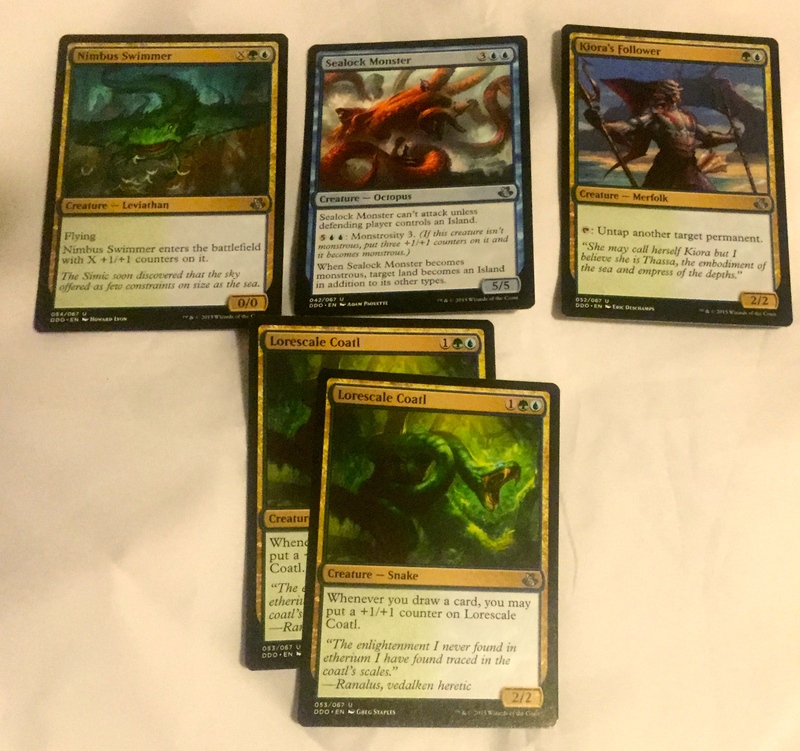 No denying what the money cards are here…the two planeswalkers combined could bring $30.00 at some places. 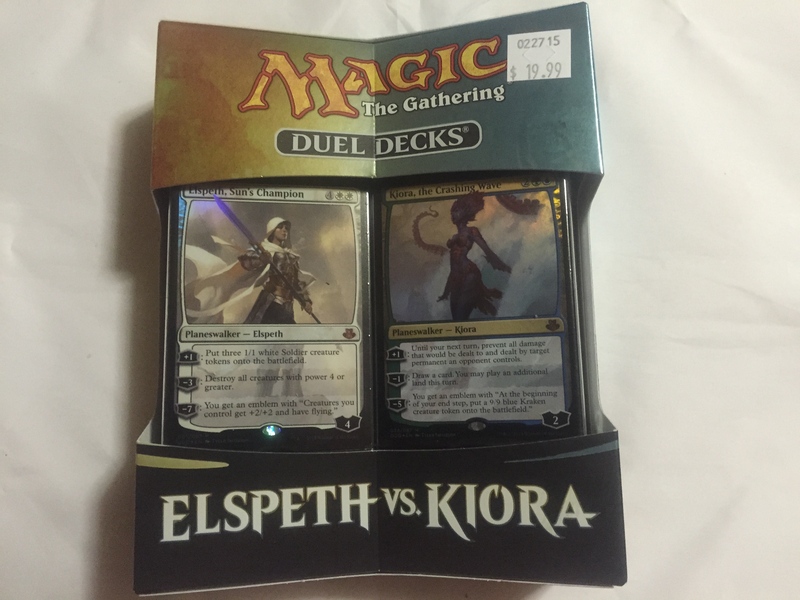 (Elspeth vs Kiora was only priced at $19.99.) So you are getting value for your purchase, no question. And because these are alternate art versions, let me just say that I find them superior to the earlier printings. 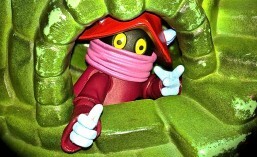 I never liked the old Kiora…it was just too creepy with that tentacle hanging out front prominently featured…and why? There is a tentacle here, but it isn’t as ugly. Elspeth’s card is very similar to the earlier printing, but I think the portrait is “prettier” this time. The box (seen above) is of a celebrated new type of cardboard, which is supposedly recyclable. Nice…it seems a little lighter. But it has just as much of a premium look as the previous planeswalker duel decks. If you will recall, I didn’t think “Speed vs. Cunning” had too great of packaging. But the Wizards like to save the foil for the planeswalker decks, and that’s understandable, I guess. 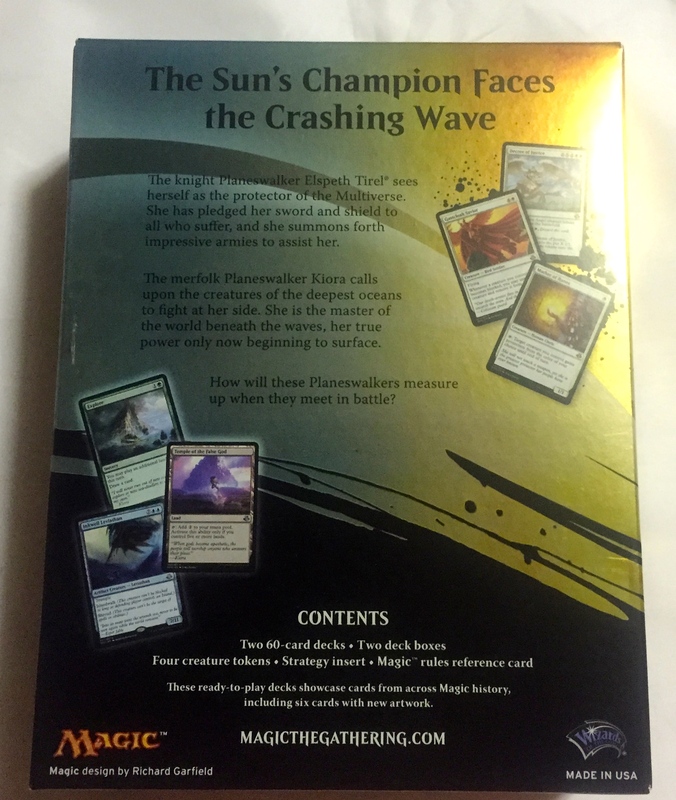 The back of the box shows off some of the featured cards, and has propaganda to help you get excited about playing the deck. Removing the box…which is really more of a carton, revealed a plastic blister over a black plastic tray, which held all of the items seen above. 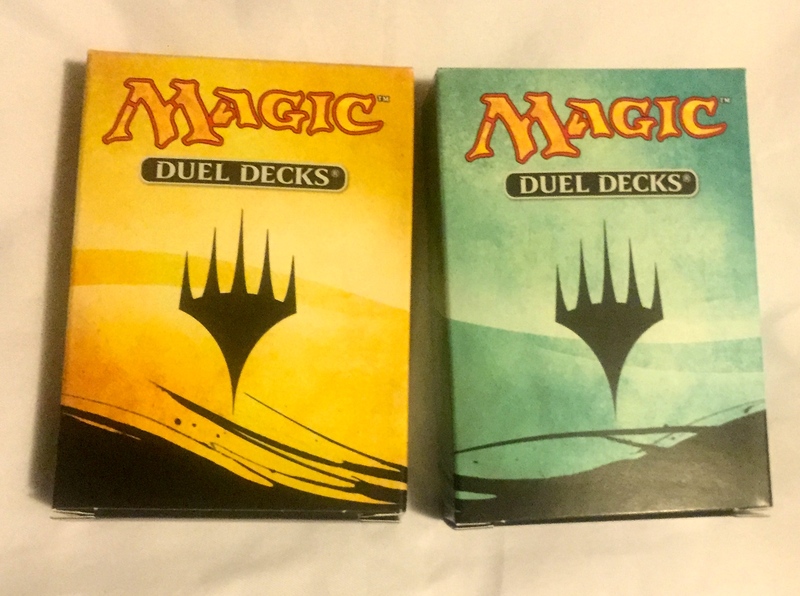 The two deck boxes are nice, but cannot hold the entire decks sleeved. 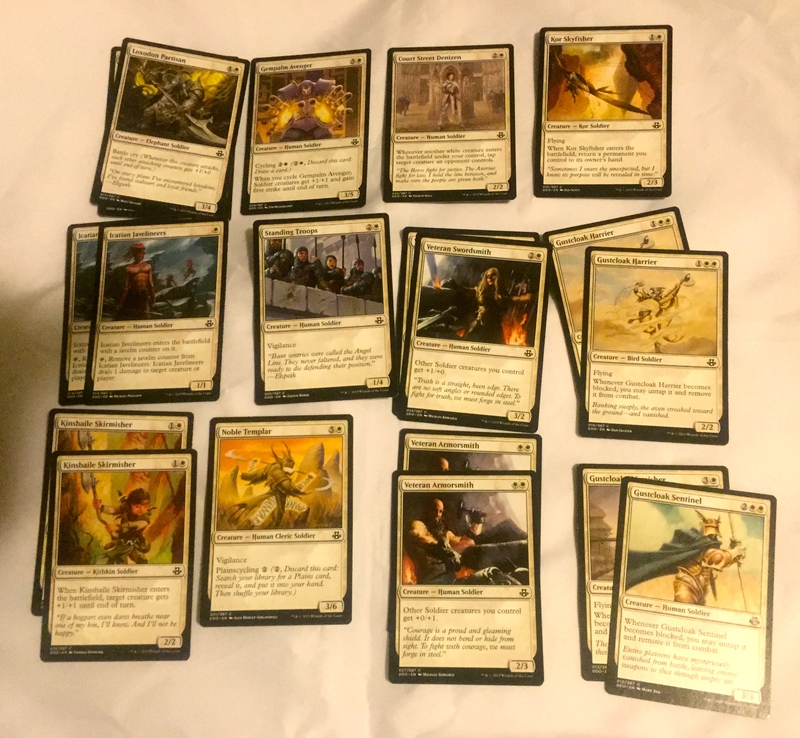 The white insert is the guide to playing magic…for new players. (Incidentally, I believe this Duel Deck to be a product for beginners.) And then there is another insert which contains details for playing both decks, and decklists. The decks were sealed in “cigarette style” cellophane wrappers. This time I thought I would photograph the cards, as it was more convenient for me. And besides, I couldn’t wait to play it. The first thing I noticed was something really dumb. You get two soldier tokens. ONLY TWO. Let me point out, that Elspeth’s top ability is “put three 1/1 soldier creatures onto the battlefield. They should have at least included one more! And what about the emblem?! 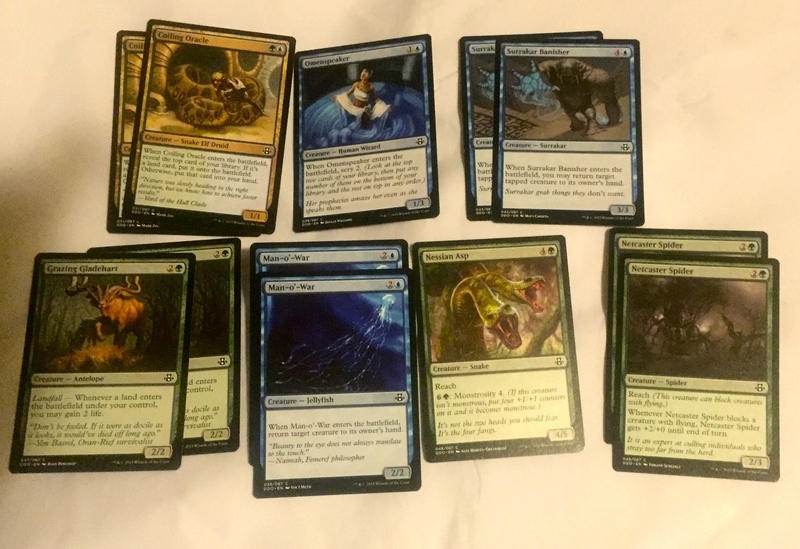 Here are the rare’s from the deck. These rares are really good for battle. Especially Gustcloak Savior. Here are the uncommon creatures. Last I checked, Mother of Runes is ALSO a money card, at around $5.00. Banisher Priest is really good with his O-ring effect. Both uncommon are every bit as good as the rares. The common creatures are generally soldier themed…and there are other Gustcloaks! Also notable…Veteran Armorsmith and Veteran Swordsmith…both have echoes in the current Kahns of Tarkir block with the warriors. The other spells in this deck are instants, except for Sunlance, which is a sorcery. All good stuff. 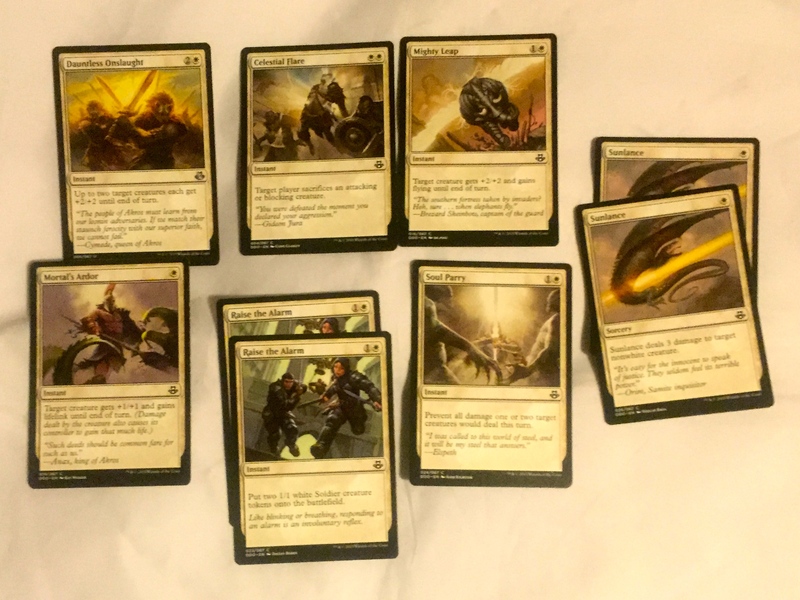 The flavor of this deck is very strong…Elspeth, Sun’s Champion would TOTALLY lead these soldiers and use these spells. Those two are lands with cycling. 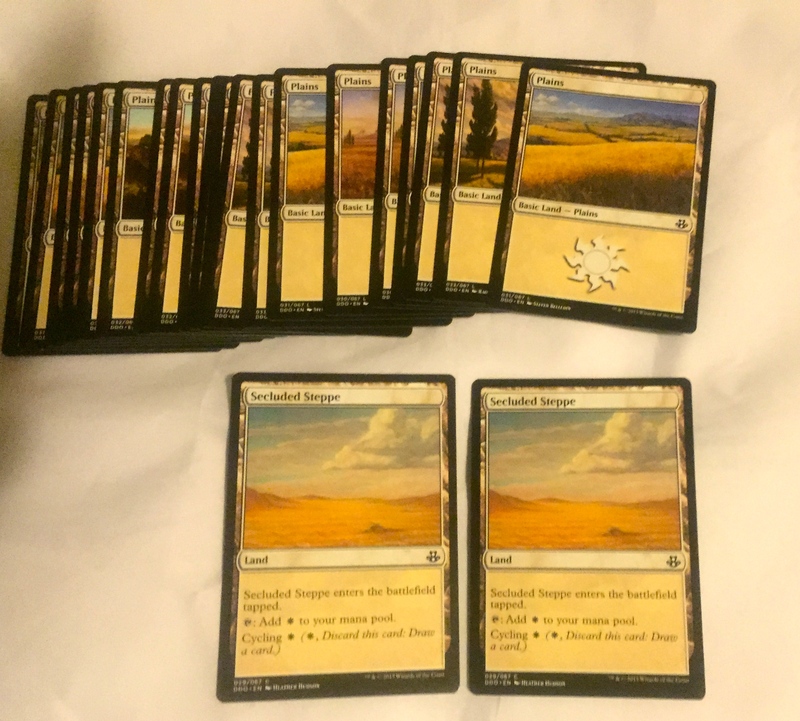 Everything else is a Basic Plains. Another dumb thing of equal dumbness. Kiora has two associated tokens, and no emblem. 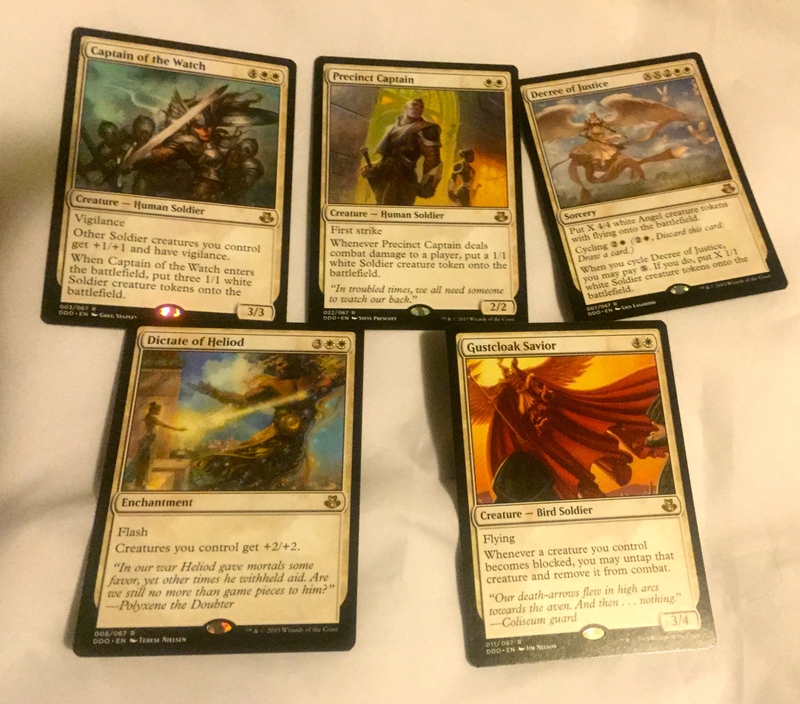 Why didn’t the wizards use the double sided tokens they gave us in Commander 2014? Plasm Capture is the odd one here. While Kiora needs some cancel, this spell almost never goes right. It costs a ton, and since Kiora is an Aggro style deck trying to get big creatures on the field, why would you have the mana available to use this spell? But a properly casted Whelming Wave can net you a win. Unfortunately, many of Kiora’s creatures are not Octopuses, Leviathans, Krakens, or Serpents. There are Merfolk and Snakes, notably. Kiora has more cards at uncommon than Elspeth. The most notable one here is Lorescale Coatle, who gets a counter each time you draw a card. He can get REDICULOUS! This deck has lots of ways to draw cards, beside the regular draw step. We’ve seen some of these cards in duel decks before…I’m thinking Man-O-War was in Jace’s deck. And Grazing Gladeheart was in Garruk’s deck. Except for Coiling Oracle and Omenspeaker, these cards just feel like preliminary cards to the main giant creatures. It is cool how there are some card draw effects and control effects attached to some of these. 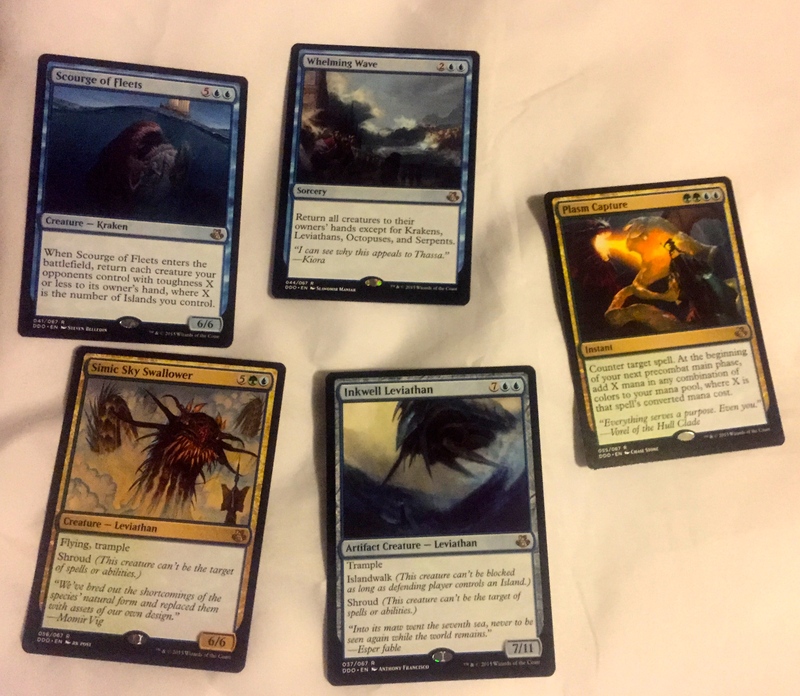 So Kiora’s flavor is Ramp, Card Draw, and Fatties. I could totally see her leading this group of cards in a fight with Elspeth. No way around it. Elspeth’s deck is better. It has cheaper creatures, and ways of dealing with things that are huge. Not that Kiora’s deck doesn’t put up a fight…But Elspeth’s “white weenie” strategy is just faster and designed to fight against big green monsters. To be fair, we have only played five times since we got the product. I will update if things change…but I’m not sure they will. The SpartanNerd’s rating of Magic the Gathering Duel Decks “Elspeth vs. Kiora”. The packaging is beautiful, and the fact that it is recyclable now is another bonus. The propaganda makes everything clear about how to play the decks. This would be a great product for new players. 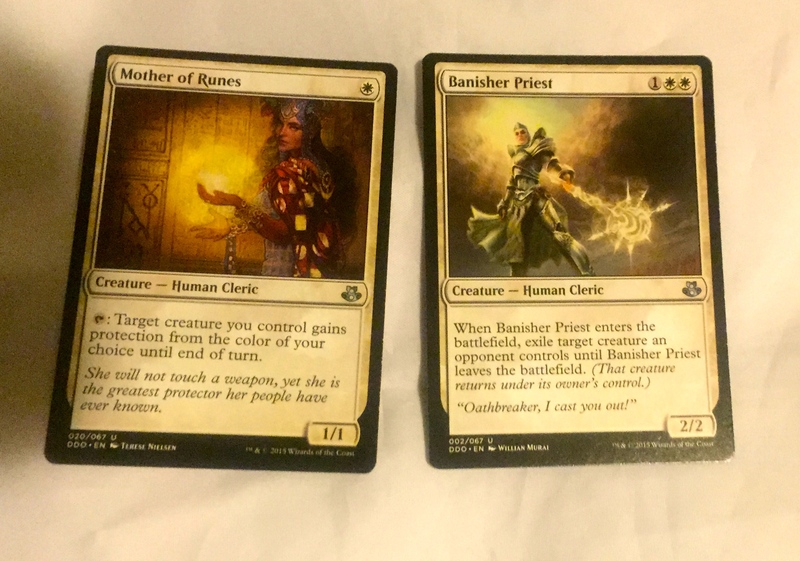 And for seasoned players, you get some alternate art cards, especially the two planeswalkers. It is a bummer that we only got two tokens with each deck…even more-so that we didn’t get an emblem either for the planeswalkers. 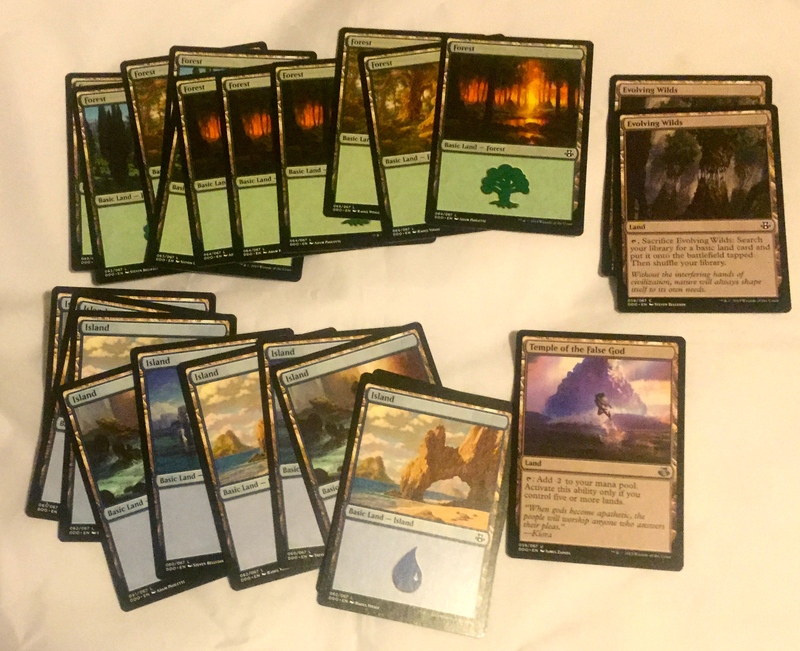 And Elspeth’s deck seems to outdo and undercut Kiora’s deck. Just a quick survey on the web and others are reporting that Elspeth generally beats Kiora. 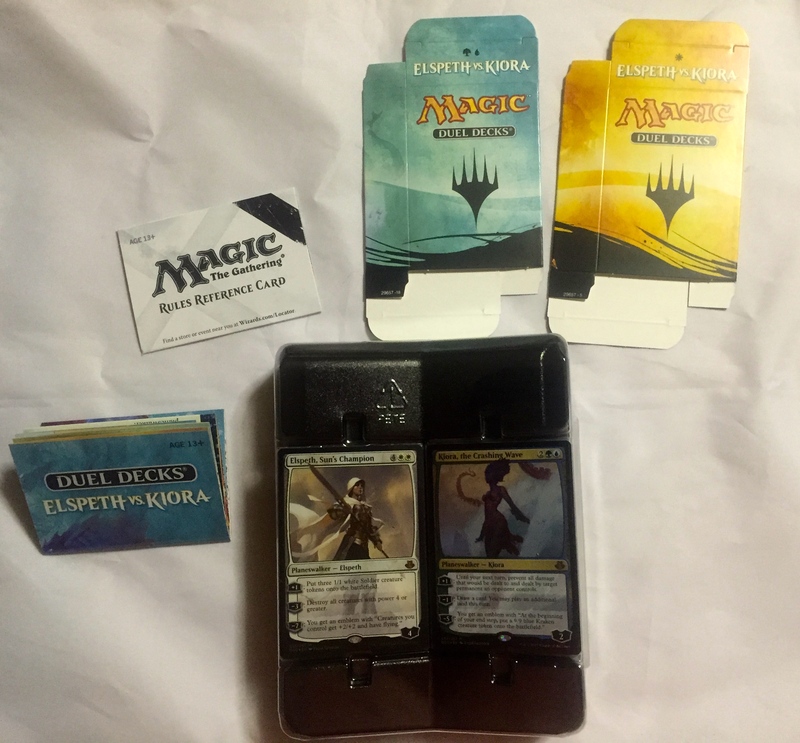 So, the SpartanNerd rates Magic the Gathering Duel Decks “Elspeth vs. Kiora” a cautious 3/5. 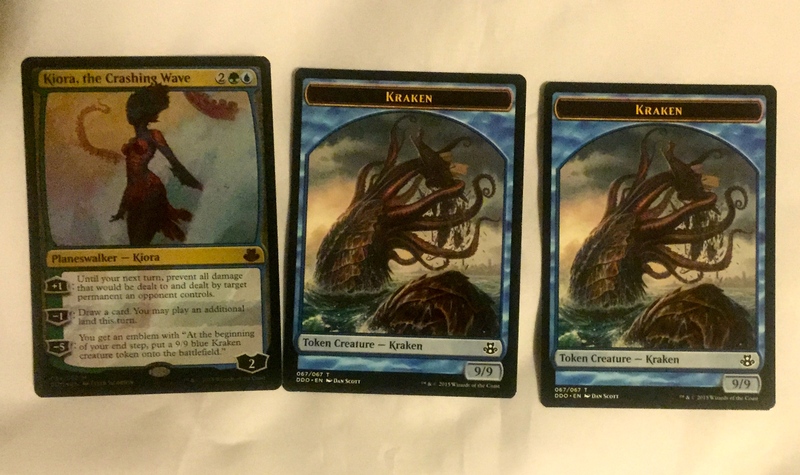 There isn’t enough wrong here to warrant 2/5…maybe with more play we’ll see Kiora bring some wins. 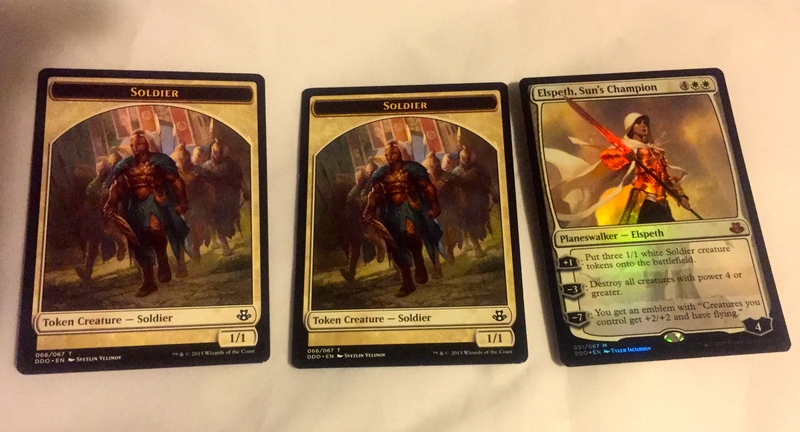 Elspeth, at least, needed another Soldier token…and knowing that the Wizards could have printed double sided tokens and gave us an emblem is even more frustrating. But that doesn’t have a huge impact on the gameplay, and the insert does tell new players that they don’t have to use tokens. So what’s your rating of “Elspeth vs. Kiora”? Let me know in the comments, oh Hub City Geeks!